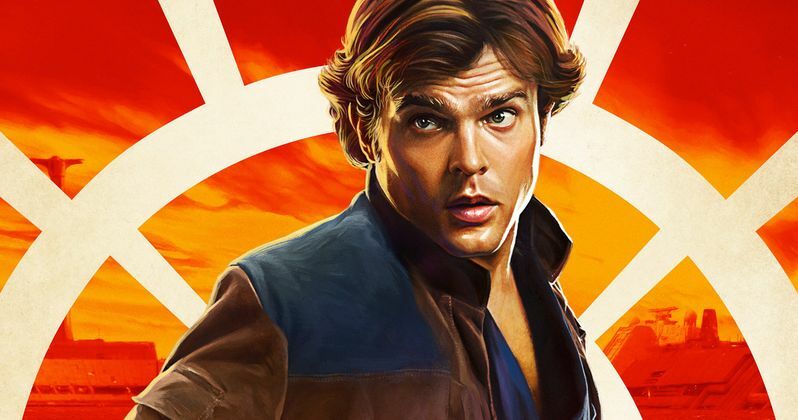 It looks like we may be seeing more young Han Solo showing up in the future. Alden Ehrenreich is set to portray the legendary smuggler in Solo: A Star Wars Story, which arrives in theaters next month. While there are a lot of questions marks about that movie specifically and the future of the Star Wars franchise, Lucasfilm is prepared to bring Ehrenreich back as Han Solo, as the actor has confirmed he has a three movie deal with the studio. Alden Ehrenreich has some very big shoes to fill. Really, it's hard to imagine bigger shoes to fill than taking up the mantle of Harrison Ford's Han Solo, but that's what the 28-year-old actor has on his shoulders. In a recent interview leading up to the release of Solo, Ehrenreich was asked about his deal with Lucasfilm. He was clearly a bit unsure if he was supposed to let this particular cat out of the bag, but he confirmed that he signed a three-picture deal. Here's what he had to say. "Three. I don't know if that's officially, uh, public. But, yeah." It was rumored that after Alden Ehrenreich first landed the role of Han Solo that he had signed on to potentially do multiple movies, but now we know for sure. As for what this means exactly? That's more mysterious. Was Lucasfilm originally planning on making this a series of Star Wars movies centered on the younger version of Han Solo? Or maybe if they are planning other standalone movies (perhaps a young Lando Calrissian movie with Donald Glover?) there's a plan to have Ehrenreich reappear in something like that. The other thing to consider is that Disney and Lucasfilm don't necessarily have to use Alden Ehrenreich in three Star Wars movies. They're certainly going to want to wait and see how Solo: A Star Wars Story does first before making any major decisions. As many fans know, this movie has had a very troubled production. Phil Lord and Chris Miller (The LEGO Movie) had shot the vast majority of the movie before being fired. Ron Howard was then hired to take over and reshot as much as 80 percent of Solo, making it one of the most expensive movies ever made according to some reports. So there is a lot riding on this movie financially speaking, and Lucasfilm also has the Star Wars brand to be concerned about. With that in mind, Lucasfilm probably isn't so eager to greenlight a Solo sequel. They need to see how audiences react first. No matter how troubled the production, and no matter how good the movie is in every other respect, if Alden Ehrenreich can't convince fans that he is Han Solo, it just won't work. We'll know soon enough, as Solo: A Star Wars Story arrives in theaters on May 25. But if it does go well, we may not have seen the last of everyone's favorite nerf herder. This news comes to us courtesy of Esquire.